Are you like me and anything on top of the cabinets just seem to stay there forever. 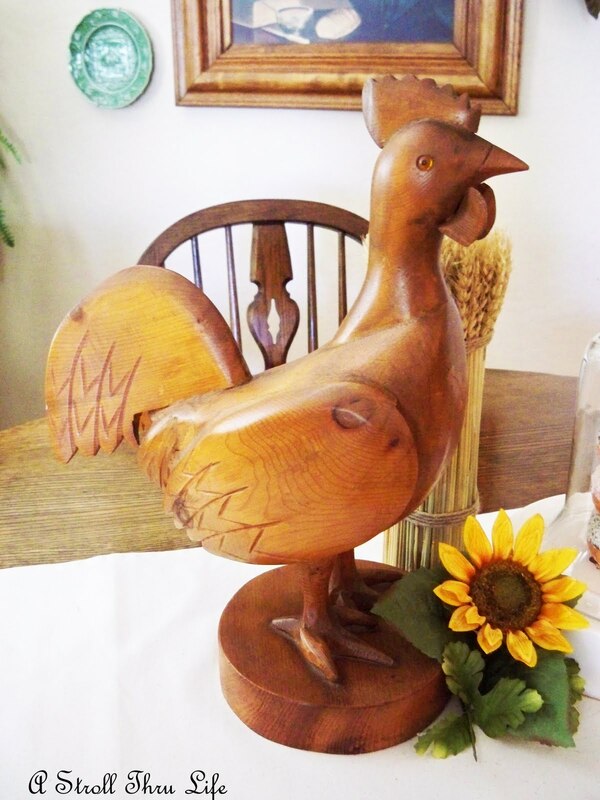 Today while I was cleaning, it suddenly dawned on me that I really wanted to bring my Pennsylvania Dutch Wood carved rooster down and enjoy him. He is a very special treasure. I had a precious friend that lived in Fredericksburg, Texas and on one of my trips to visit, I found this in an Antique store there in l979. I absolutely love this piece, so down it came and a few other things took it's place. This is where it's been since we moved in. 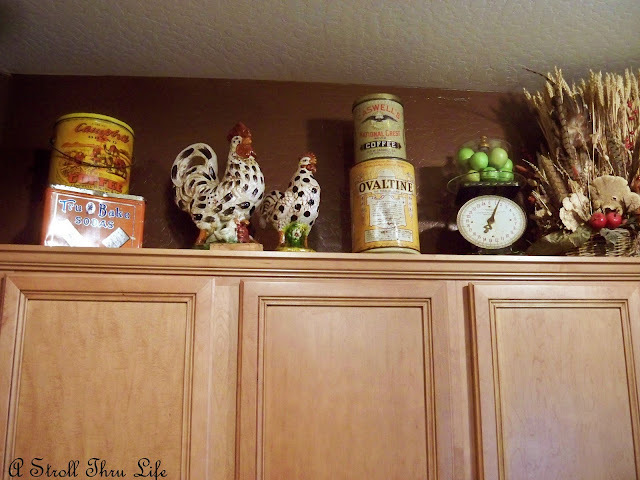 I moved a few things around and then added the spotted rooster and hen, along with the scale and cloche. Now I can enjoy him up close and personal. The patina on the wood is so pretty. What a nice change. 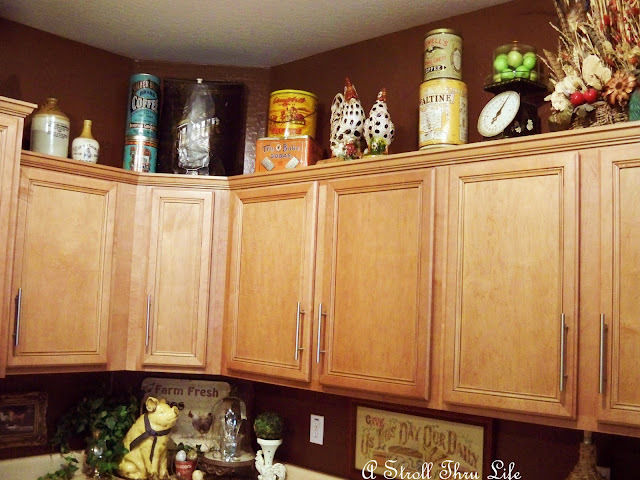 How often do you change the things on top of your cabinets? Love the rooster! I usually clean & move at the same time. This might be a good party idea. :)) What's Up Top? You're good at hosting Marty. I'm always looking for creative ways to change things up, up there. That rooster likes to live everywhere. What a treasure. He is a spectacular bird Marty! And I love how he is Pennsylvania Dutch, just sounds good doesn't it? I love the spotted roosters up on your cabinets. I have that same cloche and love that too. Happy Weekend. What a wonderful treasure Marty, no wonder you wanted to have it out in clear view to enjoy it. If your missing a rooster I snuck in your house. 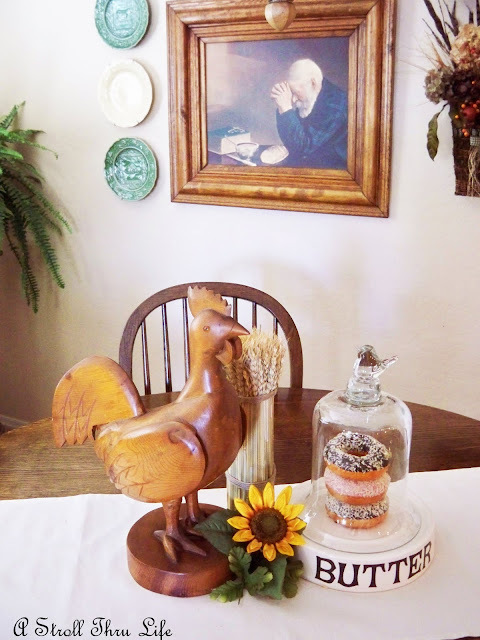 I will post my many rooster on my blog soon. Your changes to the space look wonderful. Just looked at the top of mine and I sure do need to change it around, love your rooster and yes, the wood does look as smooth as satin! OH my Marty, he is a keeper for sure. I love it. Looks so good too in your kitchen. Marty, he is a handsome guy. I like to change things around from time to time. Have to be in the right frame of mind though, and have the time and energy. I do change the top of my Irish pine cupboard fairly often, but the top of the cabinets - not so much. Mostly tureens atop the cabinets. Do you ever get to Fredricksburg anymore? 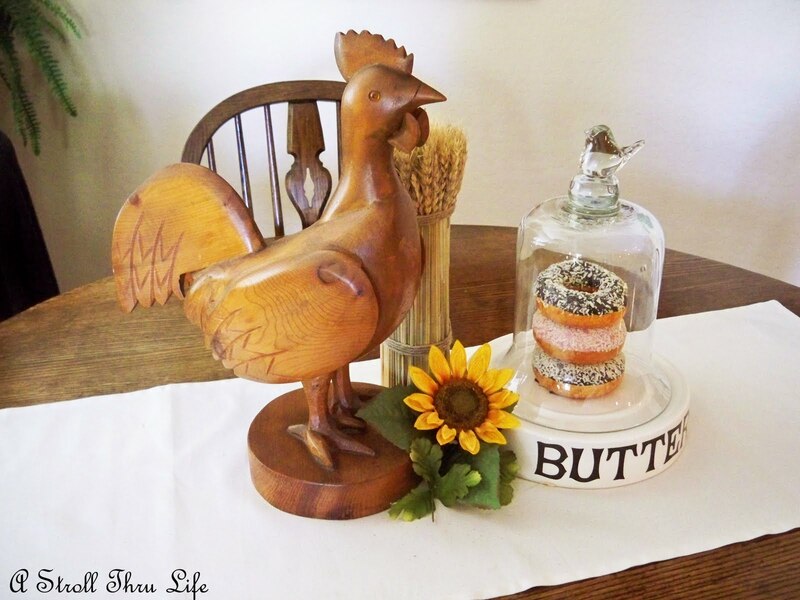 This is such a nice vintage rooster, Marty! It was such a sweet gift! Hope you will stop by to see my rooster. He's wonderful!! Quite a handsome little guy. Isn't it funny how we put things in certain places and then we get so used to them being there, we forget they're there? I do that too. Then suddenly I'll see it again and think, wow, I need to get that out and enjoy it again! You did a great job Marty...I don't have anything above my cabinets, but I must admit that I change stuff throughout the house on a regular basis...Makes my day! I LOVE your rooster - he's wonderful! Thanks for sharing the pictures too, they are so inspirational! He is a charming rooster. So glad he is getting a chance to strut his stuff! I hope your cleaning urge is "contagious" because I need to clean out my closets. Hope I catch the "bug". HI MARTY.....FIRST I LOVE THE OVALTINE TIN...VERY COOL...THE WOOD ROOSTER IS LOVELY, THE PATINA OF THE WOOD IS VERY VERY NICE AND IT LOOKS GREAT DOWN ON THE TABLE....LOVE THE BUTTER CONTAINER TOO!! Love all your gorgeous pics!! So much to look at in each one. It's like a magazine! a few years ago we went to Texas on vacay and ended up in Fredricksburg...what a happy, wonderful mistake that was. It is one of my favorite memories and I love being reminded of it. 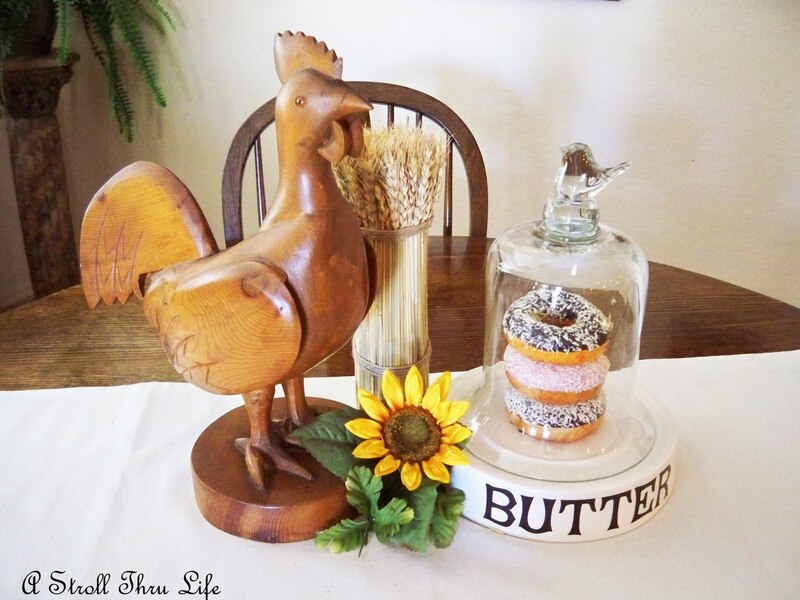 Love, love, love the rooster and your kitchen is just lovely. I need you to give me some advice! Love your rooster Marty! He sure is spectacular. Oh, Marty, he sure is a treasure! I'm so glad you brought him to front stage, it's perfect where you have it now, your rooster is a beautiful piece of work, how special! Thanks for sharing. Have a great weekend and lots of hugs. Marty he is a really special treasure! I just adore him! Marty thanks for taking the time to visit my new blog and for being my first new follower. Some things are pretty just because of the way they look (like your rooster) but, it does mean so much more when there are good memories attached. Fredericksburg is beautiful. My husband and I spent our anniversary there last year. You have a super weekend too!!! Love the rooster! 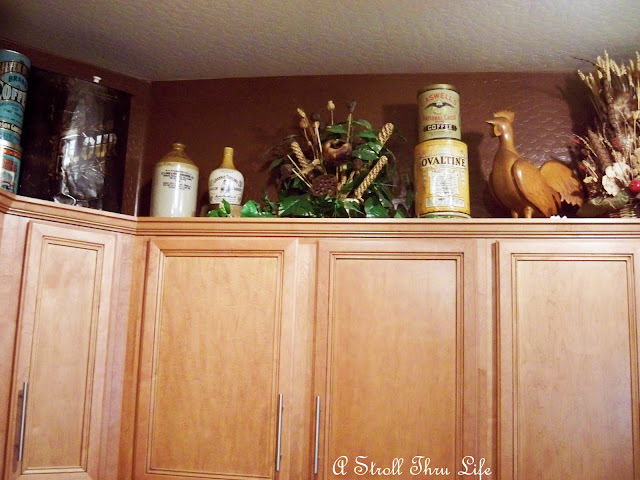 I haven't really changed things on top of my cabinets since we moved in 15 years ago, except to dust and wash! Thanks for visiting my little blog and leaving a comment on my cloches. I didn't post a picture of them all. Have several more to get on there. Thanks again for your encouragement!